Hulu's new Stephen King-inspired series, Castle Rock, tells the story of Henry Deaver (Andre Holland), a lawyer who returns to his childhood home after a mysterious prisoner, named "The Kid" (Bill Skarsgård), is found trapped in a cage underground. His return to the city sets off a chain of events, unleashing clues to the town's sordid past, which also brings Deaver's own personal demons to the surface. For those unfamiliar with King's vast slate of work, there is actually a substantial number of tales -- from short stories to expansive novels -- that either take place in the fictional city of Castle Rock, or make reference to the locale in some way. If we're keeping count (and we are) that'd be 13 tales in Castle Rock, and 24 that mention its existence. In short, the quintessential Master of Horror created this universe before cinematic universes were a thing, and way before Hulu was a glimmer in your grandpappy's eye. 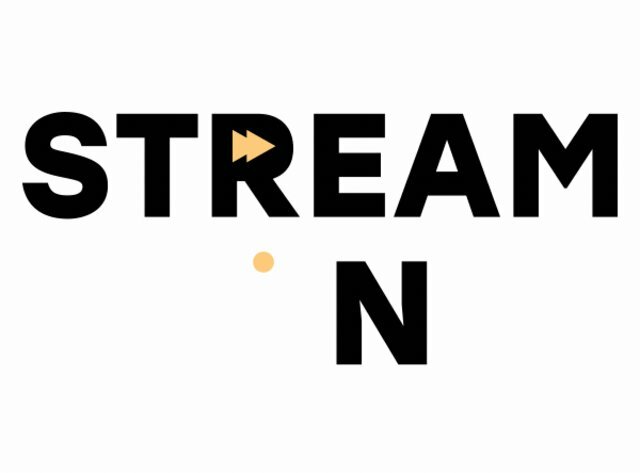 This brings us back to the 10-episode first season, which debuted its first three episodes on Wednesday, July 25. Aside from the show's cast, which features a plethora of Stephen King alumni -- Sissy Spacek (Carrie), Terry O'Quinn (Silver Bullet), Bill Skarsgård (IT), Melanie Lynskey (Rose Red), Anne Cusack (Mr. Mercedes), Frances Conroy (The Mist), and Chosen Jacobs (IT), to be specific -- other Easter eggs and references are scattered throughout the series. Some are more obvious than others, but they all seem to be achieving the end goal of further building out Stephen King's world. In case you aren't keeping track, here are the most important references (out of order, because time and space is an illusion) featured throughout Season 1 of Castle Rock. A quick refresher: The climax to The Shawshank Redemption, which was adapted from Stephen King's 1982 novella "Rita Hayworth and Shawshank Redemption," found prisoners Andy Dufresne (Tim Robbins) and Ellis Boyd "Red" Redding (Morgan Freeman), succeeding at their escape from prison while Warden Norton (Bob Gunton) chose to voluntarily eat a bullet instead of paying for his crimes. This is a history worth remembering. The opening moments of Castle Rock's premiere episode introduces Terry O'Quinn as Dale Lacey, the present-day warden of the iconic stone structure. It seems the pressures of the job were too much to bear, though. It's not long before we watch Warden Lacey, with his neck tethered to a nearby tree, drive his car off a cliff. 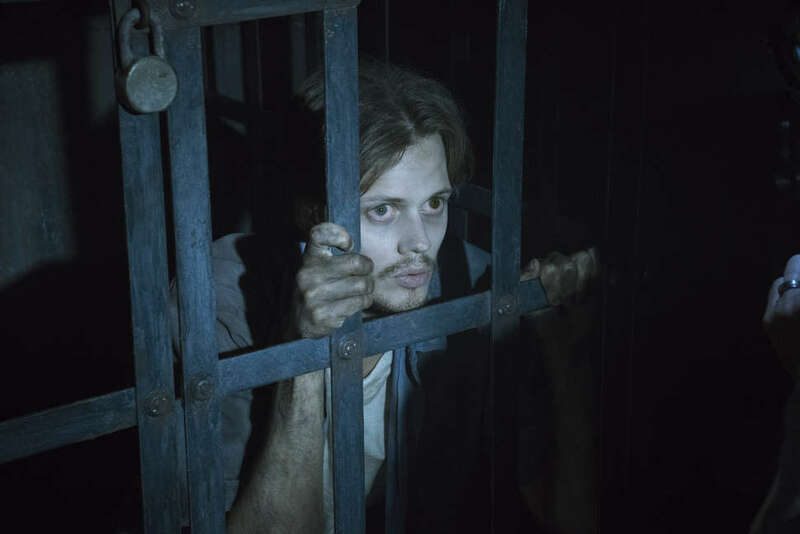 As the episode progressed, revealing Lacey's secret prisoner hiding in an underground cage, the assumption began to present itself that the wardens of Shawshank are cursed. We see this play out with Anne Cusack, whose warden shares an office with Norton's suicide bullet, which is apparently still embedded in the wall. Maybe she should've looked to said bullet, and those who previously held her position, as a warning. Unfortunately, in Episode 10, "Romans," Shawshank's newest warden met her untimely end after admitting to Molly that the mysterious Kid may very well be the devil -- right before being mowed down by a bus full of prisoners. 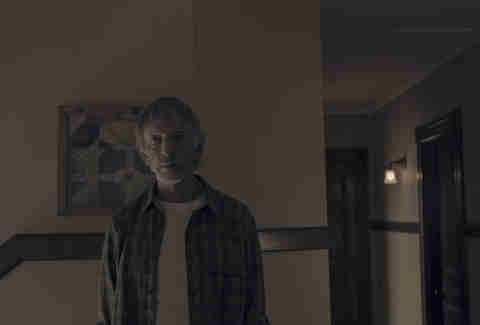 Not only do we get a postscript look at Castle Rock's former Sheriff Alan Pangborn -- previously played by Michael Rooker and Ed Harris in The Dark Half and Needful Things -- Scott Glenn's (The Leftovers) performance adds a sense of grounded bravado to the series. Pangborn, who found young Henry Deaver after he went missing for three days, has shacked up with Deaver's adopted mom Ruth (played by King icon Sissy Spacek). As Henry returns to his old home to investigate the odd mystery unfolding at the prison, Pangborn offers both Henry and the audience necessary insight. Let's remember here that Pangborn fought Leland Gaunt, the sinister satanic shop owner in Needful Things, and George Stark, the evil doppelganger to successful author Thad Beaumont in The Dark Half. As the series progressed, Pangborn revealed himself as the last bastion of sanity and hope for Ruth. Unfortunately, during the bloody chaos caused by the Kid's presence, Ruth shot and killed her beloved right there in the shed. As we see throughout the first four episodes of Castle Rock, prison guard Dennis Zalewski (Noel Fisher) was battling his own crisis of conscience as he knowingly assisted in keeping the Kid behind bars. Of course, Zalewski ends up snapping, shooting up the place in Episode 4, before he's put down for good. After a peer gives him some seemingly helpful advice about smiling more, Zalewski draws a bunch of smiley faces on the security screens he's being paid to monitor. This might be a slim connection, but there's a recurring theme of smiley faces throughout Stephen King's repertoire. Not to mention, they're a visual associated with the demonic Randall Flagg as he sets out for his epic, post-apocalyptic battle in The Stand. After Lacey's suicide, a question is raised regarding Shawshank's abandoned Block F. It's not long before the closed-off section of the building is explored, leading to the discovery of the mysterious prisoner in that cage. One thing that caught our attention, though, is the mention of "the Christmas fire of 1987" as the ultimate cause for Block F's closing. While this doesn't necessarily impact the series story as a whole, we did a little research and found that 1987 was the same year Frank Darabont bought the rights to King's novella, "Rita Hayworth and Shawshank Redemption." Could this be a shout-out to the Oscar-nominated writer/director, and former Walking Dead showrunner? Weirder things have happened. Frank Dodd sure wasn't a demon, a psychic, or the devil, but his legend lives on through Castle Rock's sordid history. His story was initially told in The Dead Zone -- the book, the movie, and even the TV series adaptation. A serial strangler who raped his victims before murdering them, Dodd once acted as the deputy sheriff in Castle Rock and used his power to take part in the investigation of his own murders with the goal of consistently staying ahead of the police. As soon as psychic advisor Johnny Smith (played by Christopher Walken in the film and Anthony Michael Hall in the TV series) entered the picture, things went downhill for the killer who, when all was said and done, ended his life. Why is this important? Apparently, Molly Strand lives in Frank Dodd's house. As she shows Warden Lacy's home to potential buyers, Molly makes light of his death by saying serial strangler died in her house, and she "still sleeps like a baby!" Episode 2 opens up with a voiceover narration by Warden Lacey, giving the audience a closer look at Castle Rock's tortured backstory. As the camera closes in on a high school football game, before the school's mascot jumps from the building's roof, Lacey references the body of a boy found on train tracks. It's a brief statement, but one that references Stephen King's "The Body," the novella that Rob Reiner turned into the much beloved coming-of-age movie, Stand By Me. Another quick shout out to King's novella came at the end of Episode 5, "Harvest," as Molly finds the Kid on the rooftop looking out over the city. A barrage of thoughts and voices cloud his head as we hear a boy ask, "Wanna see a body?" It's a line directly pulled from "The Body," which was also used on Rob Reiner's film. Henry Deaver flips through a few articles in Episode 2, "Habeas Corpus." One references Leland Gaunt's oddities store from Needful Things. The other references a rabid dog that tears through town. It's an obvious shout out to Cujo, King's tale about a ravenous Saint Bernard. 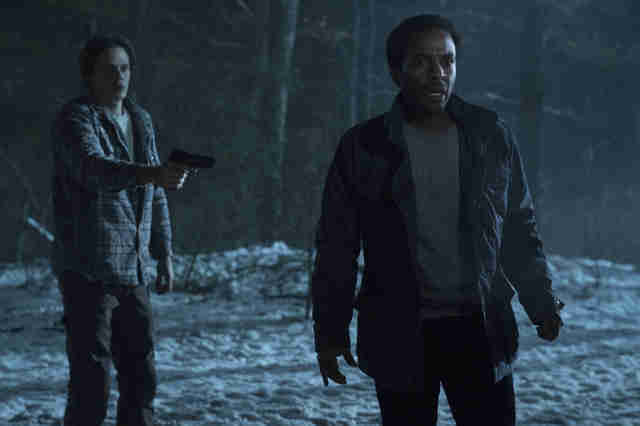 Aside from the multiple visuals of angry canines that appear throughout Castle Rock, leaving many to think of Cujo, and even Gerald's Game, there's also an ongoing Pet Sematary-style motif that resurfaces time and again in the series. In Episode 2, Alan digs up a suitcase that holds a the body of a poor "neighborhood mutt," which was hit by a truck outside Ruth's house. Ruth ends up convinced the dog is still alive. This theme is once again revisited in Episode 7, "The Queen," where Ruth is shown digging up the dog to find old bullets she packed away in that suitcase. As the episode progresses, showcasing her slipping grasp of time and space, we see the animal alive in places -- putting the concept of life and death in limbo as her sanity slowly begins to crumble. In Episode 3, we hear Molly Strand promote her idea of a new Castle Rock development on the city's news show, "Local Color." Earlier, Molly and Jackie discuss these plans -- which includes the appearance of a model of a miniature city. In this scene, the struggling realtor adds one of the model's final touches: a lovely little gazebo. Once upon a time, Castle Rock had a gazebo. During Alan Pangborn's younger years, and one of his more notorious battles, the gazebo in question was destroyed. Leave it to the all-out explosive firestorm that brought down the evil Leland Gaunt during the climax of Needful Things to be the catalyst behind the original gazebo's destruction. In Episode 4, Henry Deaver attempts to piece together any details of his childhood disappearance, which leads him out to the home of one Vince Desjardins. Through some digging, Henry learns that Vince not only had a felony on his record, but he lived near the wooded spot where the lawyer went missing as a boy. Desjardins ended up innocent of kidnapping, but his name holds a deeper meaning within the Stephen King universe. During his teenage years, Vince hung out in a gang of hooligans led by a bully by the name of John Merrill -- better known as "Ace" -- in the Stephen King story, "The Body." In the film adaptation, Stand by Me, Ace was played by Kiefer Sutherland and Jason Oliver took on the role of Desjardins. When Castle Rock's Historic Bed & Breakfast opened for business in Episode 8, "Past Perfect," the ongoing theme of 27 years was mentioned again. Yes, Pennywise the Clown returns to Derry, Maine every 27 years. And yes, Bill Skarsgård plays both the Kid in Castle Rock and the monster in IT. And yes, there are multiple visuals of balloons shown throughout the series, really driving home that creepy, yet nostalgic Pennywise feel. AND YES, Henry Deaver went missing as a wee lad back in 1991. But… when Professor Gordon refers to the city of Castle Rock as "The Murder Capital of 1991," it surely is a reference to all the things mentioned above, and more. His statement, made inside of "the first fully immersive lodging experience for the true crime aficionado," may be a nod to Leland Gaunt's store of oddities in Needful Things. The story first appeared on the printed page back in 1991, the year King's book was published. One of the more ancillary references in Castle Rock is that of Juniper Hill. The building shows up in multiple episodes after a doctor suggests that Henry take the Kid to the asylum. In Stephen King's IT, adult Henry Bowers serves time at Juniper Hill. The establishment has been referenced throughout King's other tales, including the likes of Needful Things, Bag of Bones, The Dark Half, 11/22/63 and The Tommyknockers, to name a few. In Episode 6, "Filter," Henry Deaver finally got some insight regarding that pesky ringing in his ears. As much as his abusive father was convinced the noise in question was the Voice of God, Deaver got the real scoop from deaf scientist Odin Branch and his interpreter Willie one night out in the woods. According to them, the noise he's hearing is actually something called "the schisma." It's a symptom of an imbalanced universe attempting to right itself as multiple timelines or realities converge. And as we learn in Episode 9, "Henry Deaver," the Kid is actually Henry Deaver from a different reality altogether -- and when this reality's Henry went missing, he actually crossed over into the Kid's world, sending everything out of whack. The concepts of the schisma and the thinning of reality barriers are nothing new in Stephen King's tales. In The Dark Tower series, the ringing in one's ears are referenced as "the subaudible" and it's directly connected to what's called "the thinny," or that place between realities where the barrier is most vulnerable. As part of 11/22/63's time travel motif, hero Jake Epping ends up disrupting the natural order of things, prompting the Yellow Card Man to shout, "You're not supposed to be here!" at Jake, which is a similar sentiment Henry #2 makes throughout the season finale. All work, no play, etc. Of course you can't do a Stephen King-themed TV series without some sort of connection to The Shining, and the introduction of Jackie Torrance, Sam Shaw, and Dustin Thomason throw the audience a bit of a red herring. While she eventually explains her distant connection to Jack, Danny, and Wendy, we learn Jackie's real name is Diane -- and she only changed it to pay homage to the massacre at The Overlook Hotel because her life in Castle Rock is, in her eyes, boring. That all changes in Episode 8 after the couple who purchased Warden Lacy's old home decide to turn it into a murder-themed bed-and-breakfast. Soon, after finding a bunch of paintings of Henry #2 in the basement, the B&B's co-owner, Professor Gordon, hacks a naked couple to pieces. The aftermath of bloody body parts strewn about looked similar to that of carnage Delbert Grady left after murdering his daughters in Stanley Kubrick's big-screen adaptation of the tale. Later, after Henry Deaver is attacked by both the professor and his wife, Jackie swoops in to save the day, striking Gordion in the back of the head with an axe. Sure, Jack used a croquet mallet in the novel, but that's just splitting hairs. Jump forward to the finale and we get a glimpse at a chase happening between young Henry and his father. They're in the woods and it's snowing, turning this father-and-son chase into a stylistic callback to Jack and Danny's hedge maze hunt in Kubrick's film. Reverend Deaver was not lugging an axe as he searched for his son, but as Henry reached the cliff and slowly retraced his steps, placing one foot carefully in each footprint behind him, the callback to the horror movie classic was made perfectly clear.